Towers of Thanks by Res is a photographic sequence that engages with their mother’s involvement in the Trump Organisation. Barbara Res was the manager of construction on Trump Tower and executive Vice President of the Trump Organisation for nearly 20 years, but in the run-up to the 2016 Presidential elections developed an oppositional and public stance against Trump and his candidacy. Towers of Thanks taps into the superficial, jarring aspects of Trump’s legacy and language – we see his words move from those of effervescent praise to pithy, 140-character condemnation – and looks at how that legacy influenced their family, describing the uncomfortable shifts between political and personal narratives. 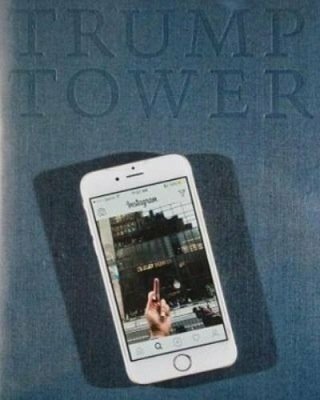 The resulting sequence of photographs blends archival imagery of the Trump Organisation with Res’ photographic interpretations of their mother, of Trump Tower, and of the ways in which photography contributes to myths of power and success. Text: Res. pp. 32; paperback. Publisher: Loose Joints, 2017. Request info for "Towers of Thanks"